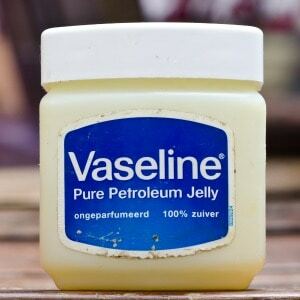 August 30, 2017 2 comments on "Removing Vaseline from Hair"
Tip #1: When my son was a baby, I kept a nursery jar of vaseline on the window next to his bed (yes, I know, bad location!) One day just after Christmas I went in to get him up from his nap to find vaseline on the wall, the bed, the sheets, the curtains… and in his hair. Tip #6: I was listening to Esther Williams a while ago, mentioning that her ’50s and ’40s hairstyles were kept together underwater with a mixture of vaseline and baby oil. Then I made the mistake of getting the stuff in my hair. Head & Shoulders shampoo is good stuff, and normally very effective – but it had no effect on the vaseline. Five days running, and it was still in there after repeated washings. Did keep the hair flat in a wind, though. I got it out with RC Cola. More than once. Just pour a little of it in your hair and rinse. Repeat if you need to. It’s quick, painless, and uses stuff most of us have in the fridge. I haven’t found any normal soap (lye might work?) that could take out vaseline like Coke does. Simple and effective. The police, I’m told, use RC, Pepsi, or Coke to clean away bloodstains at the scene of messy traffic accidents. Tip #8: I had recently gotten head lice from some children I was babysitting. Luckily, I found it before my children also got it, or we’d have been in a real mess. I knew that the OTC treatments do not have a reputation of working, so the children’s grandmother suggested the vaseline method. She said a couple rinses with dawn and it would come out, no problem. 1 bottle of dawn, 1 bottle of olive oil, a jar of peanut butter, 3 boxes of corn starch, and 3 days later, I could still pull off the Albert Einstein look. I was actually considering cutting my very, very thick, mid-back length hair, that I’ve been working on growing out for a while now, off. In my desperation, I went to WalMart to the auto section and grabbed a bottle of the orange scented pumice you use to get grease off your hands. I started in the back, parting a row at a time and used my thumb and finger to kind of work it through the hair. I actually used the nail brush it came with to help run it through, but I’m sure a fine tooth comb would do the same, if not better, then took a paper towel and ran it down the hair to kind of pick up any excess. When I was finished, I used a comb and just did a quick comb all over. Then simply shampoo and conditioned in a warm shower, towel dried, picked out the tangles, then let air dry. Tip #9: I put a relaxer on my hair and I’m Caucasian. I thought since my hair is very curly that maybe a relaxer would make it easier on me so I wouldn’t have to straighten my hair every..single..DAY. Well, my hair definitely came out straight but one HUGE thing… it killed and fried my hair. My ends were coming off when I brushed through it and it was just a horrible mess. I cried for about an hour then I cut off the dead/fried terrible ends. It worked a little bit, but my hair was still poofy and dead, just not so smooth. So I decided that maybe petroleum jelly would moisturize the texture of my hair. BIG BIG no no. I showered and washed my hair about 10 times in one night. Nothing. I looked on here and read other people’s comments about using baby oil, baby powder, eggs, cornstarch, etc., and saw a comment with these two little words: peanut butter. 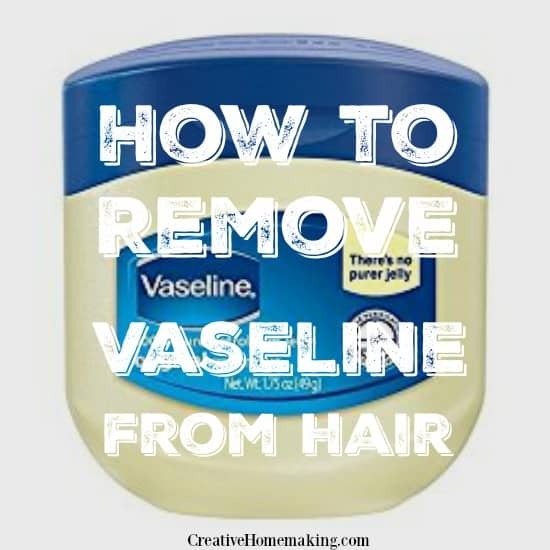 2 Comments on "Removing Vaseline from Hair"
I’ve put a lot of vaseline on my hair three days ago and after the first wash my hair was so oily and couldn’t get out because of it. The next day i tried olive oil and left it for some hours and then rinsed but it was still oily but not as much as the first day. Today i’ve just put olive oil again and then i used baby powder (a lot of it) and it was really a good idea because i can feel that it helped now i rinsed it and it’s really good. So try baby powder with some oil.